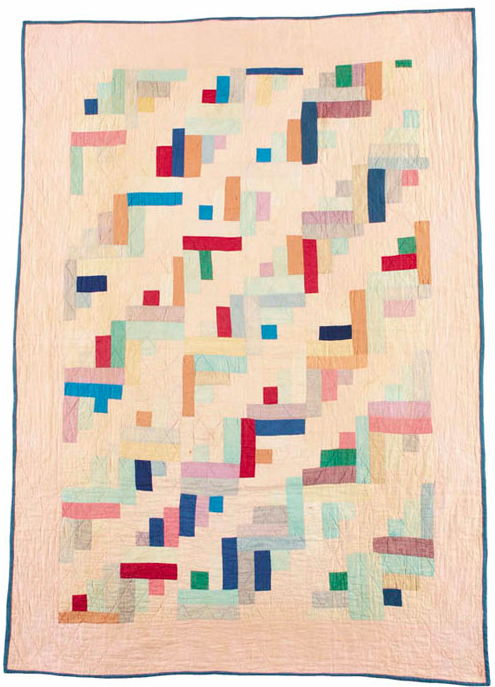 Nebraska’s International Quilt Study Center | OccasionalPiece--Quilt! 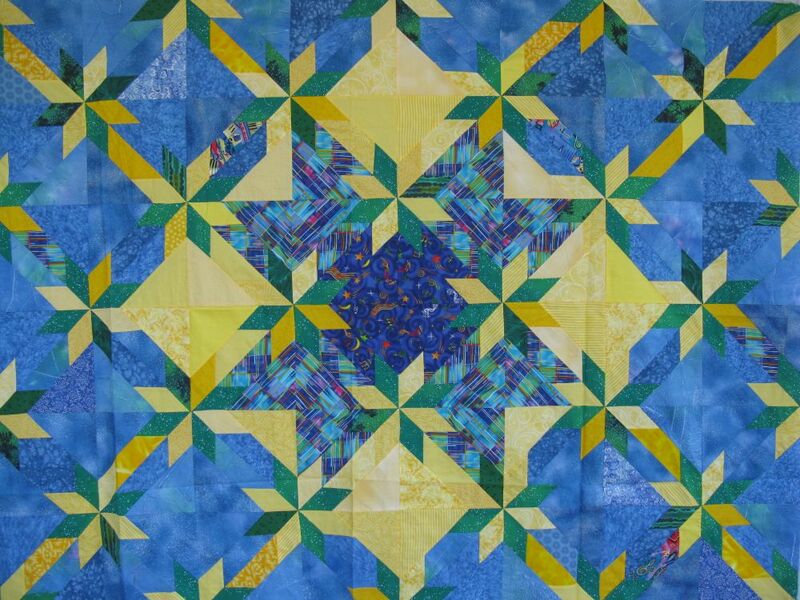 Posted on April 6, 2012 by Elizabeth E.
Recently I commented on another Debbie’s block, titled Hopscotch, saying that it was an interesting variation on a Hunter’s Star block. She wrote me back, included the link to the pattern she used, and said she couldn’t find a Hunter’s Star block that she thought resembled what she was making. 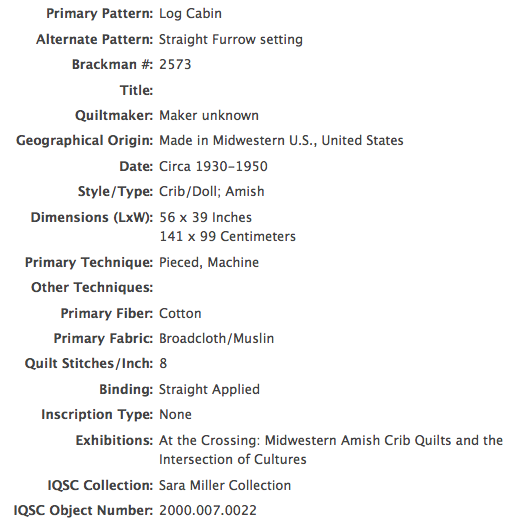 While doing this research I dragged out my Barbara Brackman Encyclopedia of Pieced Quilt Patterns (which if you don’t have, save up the grocery money and get one) and then headed over to my other favorite source: the International Quilt Study Center and Museum at the University of Nebraska-Lincoln (IQSCM). If you haven’t seen this website, head over there. Click on Collections (in the black bar at the top) and then spend time scanning triangles or Log Cabins or whatever you feel like. My advice is to set the number of the results per page to 50, as you can scroll through them quickly, stopping to enlarge the ones that catch your eye. Like this one, made between 1930 and 1950. Info below. Or this one (IQSC Object Number: 2003.010.0009). I think the maker, who put this together sometime between 1940 and 1970, may have had our modern sensibilities when she made her colorful creation. 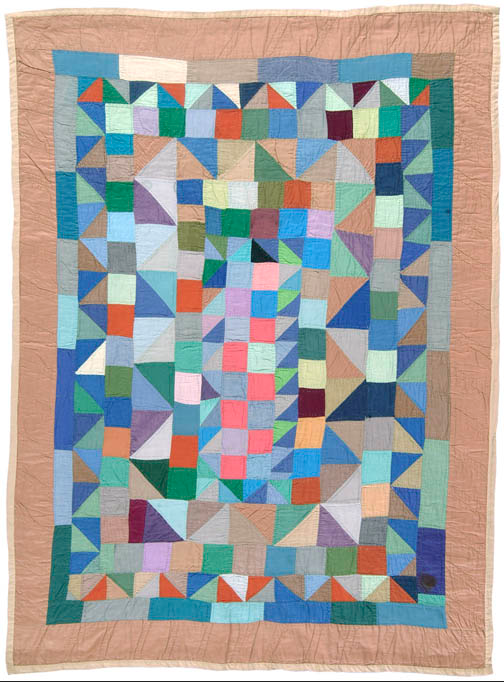 Why are we always so quick to declare ourselves free of these amazing women and their quilts? What is it about our quilting community now that only wants to have the latest thing on the block? It’s well-known that any new idea is really only about 10% new, and while I hope to have a few new ideas here and there, I recognize my debt to these early quilters. I also love seeing what women in THIS day and age are creating. To me, it’s one big happy quilting world. I think it’s interesting to notice in this screen shot of the listing, that there is a place for the “Brackman #” (another reason to buy that book). 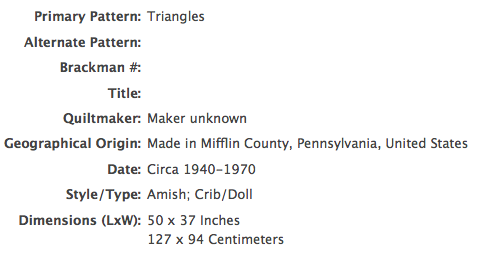 I have compiled hundreds of numbers of quilt blocks I want to make from Brackman’s book. Pinterest (of which I also like for the ability to “curate” my own collections of ideas) has feeble numbers of ideas compared to the riches of Brackman and the IQSCM. Happy Quilting, to all of us quilters–both modern and vintage, new and old! That is a wonderful resource, thank you Elizabeth. I totally see the resemblance between the quilt patterns, it is interesting the big change is from the eight to the six pointed star. How incredible! I had no idea such a place exists and thank you for sharing. That log cabin is so interesting. It completely captures the artistic sensibility of the era and I’m having trouble not wanting to recreate it for myself. Amazing. On another note, your fabric arrived yesterday. Woot! !